There have been a few things happen since the last update, but first some photos of Pogo. Pogo still often back-rides and rarely ventures too far from his mother Sasha. The first bit of news is that YouTube have reinstated my video "Epic Possum Fight: Piranha v Marlon", without apologising, or even informing me of the fact. I don't know if the strike has been removed from my channel (there is no way to check), but I would hope so. I currently have a couple of videos that I want to post on YouTube, but as luck would have it, both involve animal fights and one of them is arguably more violent that the Epic Possum Fight video above (although there were still no visible injuries inflicted). So I'm holding off on doing this for a while, and I will probably take care to title/tag the videos using language less likely to upset their poor sensitive little bots. E.g. 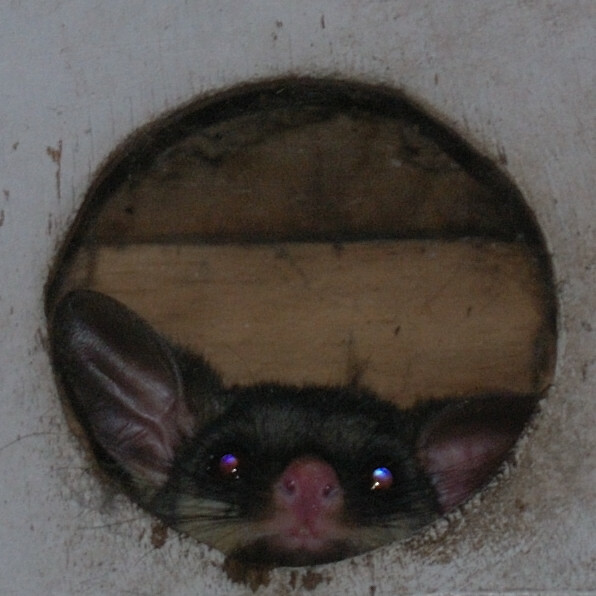 "Two possums constructively debate the ownership of a nestbox". 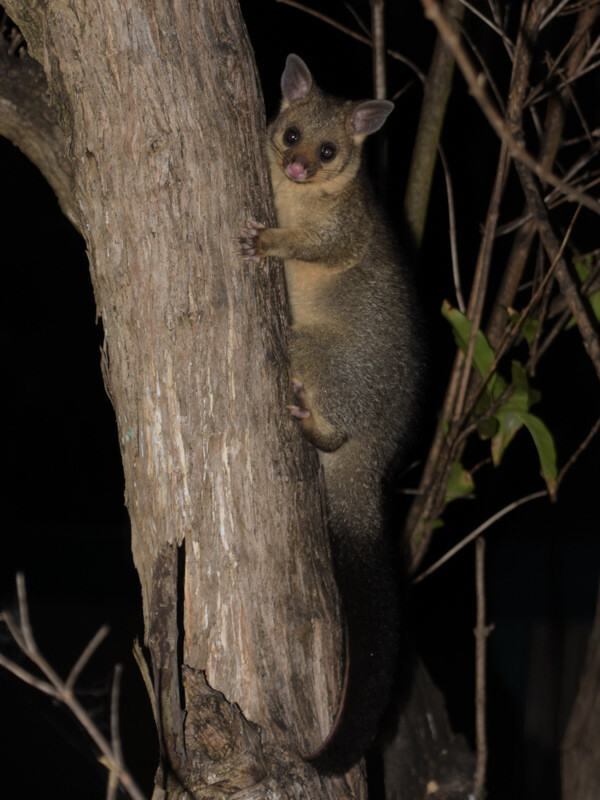 Not long after I published the last update, Sasha decided to deal with the intruding brushtail (possibly Toto or one of descendants) who had been giving her cheek. The intruder had been using Box 1, and before she (the intruder) could leave for the night, Sasha forced her way into the box and fought with her. There was a prolonged fight after which Sasha was ejected from the box, however Sasha had made her point and the intruder has not been seen in the area again. Pogo, who had previously been riding on Sasha's back, clung to the outside of the box while the fight was going on. I have some footage of this fight filmed from both inside and outside the box which I intend to edit together and post on YouTube, once I get up the courage. The other movie is of a Brush Turkey fight. This is the first real fight that I've witnessed between Brush Turkeys. Often male and female turkeys will squabble and sometimes turkeys chase each other around the yard, but these aren't what you'd call real fights. In this case, however, the two turkeys were facing off on top of a mound, trading what I am sure were very provocative turkey insults and pecking and flying at each other. What I think might have been happening was that Merlin, who built the mound, had disappeared, and two younger males were deciding who should take it over. Unfortunately for both, Merlin subsequently reappeared. Or at least I think it was Merlin - it's difficult to tell what was really going on and it's not clear to me why Merlin would abandon his mound for an extended period. 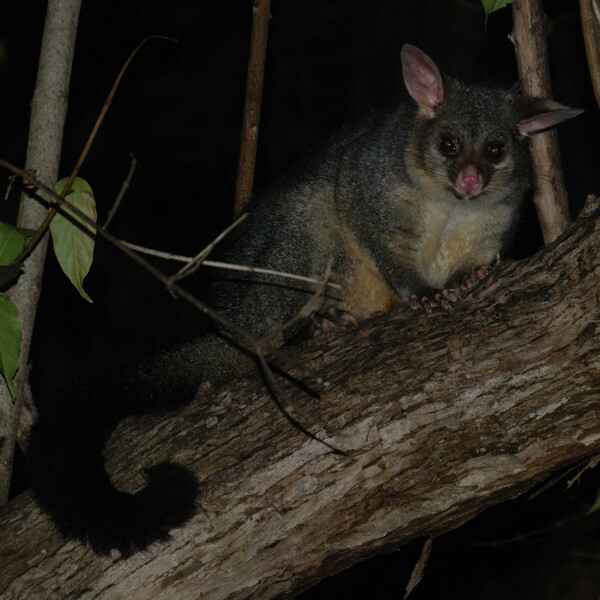 Another thing that happened was that not long after I published the last update, the large numbers of possums who had previously swarmed the place all suddenly stopped visiting. A couple of days later the cause became apparent; a carpet python about 2 m long was seen in the front yard. As usual, the possums knew about the python long before the humans and took precautions. Sasha stopped using possum boxes, and instead went into one of the possum apartments in the garage, where she could more easily survey the inside of the garage for any approaching threats. There is no way that Sasha could be eaten by a python of this size, but Pogo would certainly have been at risk and Sasha was taking special care for his sake. Koji was seen in the camphor laurel behaving very differently to usual. Normally when he's seen in this tree he eagerly makes his way towards the balcony to visit the humans for a snack. 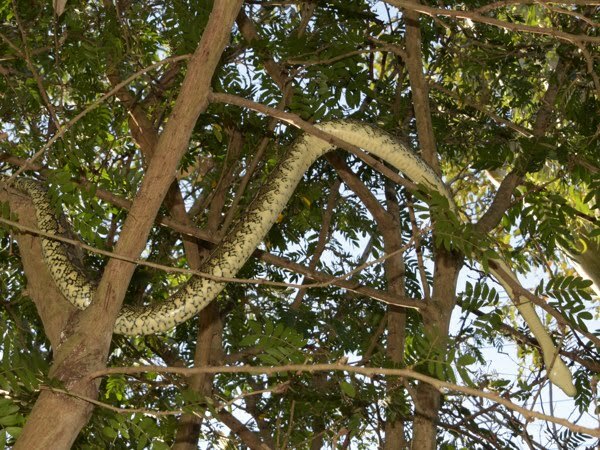 This time, however, he ignored the humans and instead hung onto the outside of the tree in a place where he could keep an eye on the python that was perhaps 15 m away. Koji had helped care for his younger siblings after his mother was killed by a python early last year, and he also learnt a lot from his father Wasabi, who narrowly escaped the python who killed his mother and twin, so he is very much aware of the threat that pythons pose and was quite likely deliberately keeping tabs on the python to ensure the safety of his family. All of the ringtails (and particularly the babies who disappeared altogether for several weeks) made themselves very scarce at this time. The house is probably a dangerous area when there's a python around (they often hang out on the roof and hide in the gutter, and the distracting lights and human noises may make it more difficult for possums to detect them), so it's possible the older possums had ordered the youngsters to stay well away. 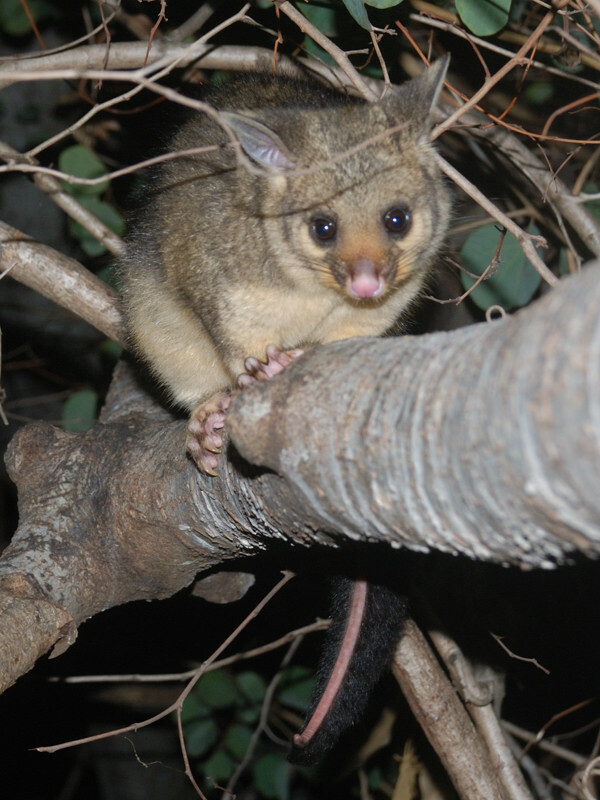 Subsequently, Ghani was seen high up in a tree eating buds on several occasions, and as far as I can tell, all of the known possums managed to evade the snake. By the way, I am starting to think that Ghani is actually a little girl possum. 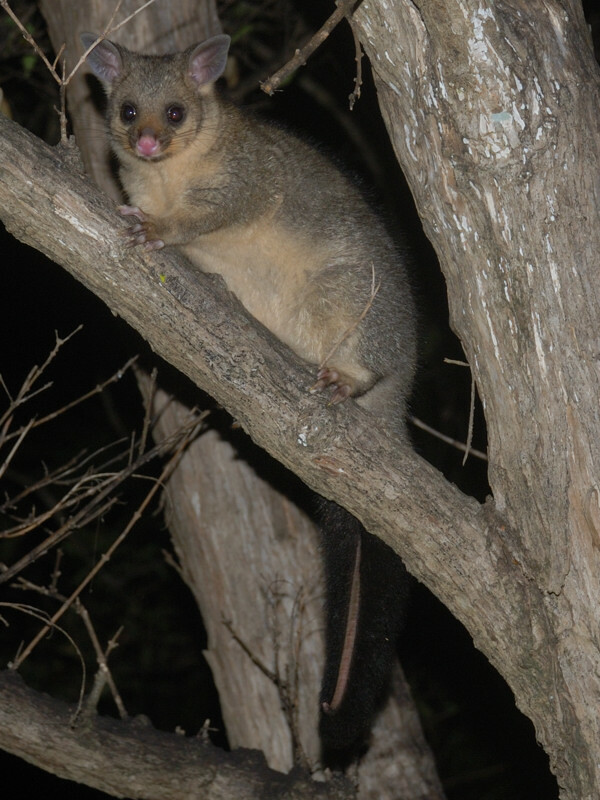 For a little while, the only ringtail visiting was Nikita, or at least the possum we're calling Nikita at the moment. There are at least three ringtails (two female and one male) of the same age as Nikita and Akira who have been seen about the place and it's difficult to tell the origin of each one. I think that Bilbo is still around. He hasn't come near the house in a while but recently started sleeping in box 2 again (I assume it's him because the possum looks the same size and shape). He may be suffering some stress at the moment, because when he first reappeared, he entered box 2 at 8:20 pm (normally a possum will enter a bit before dawn) and didn't leave until 7 pm the following night. It could be that he was evicted from his previous sleeping place and was exhausted after spending the previous day on the run. 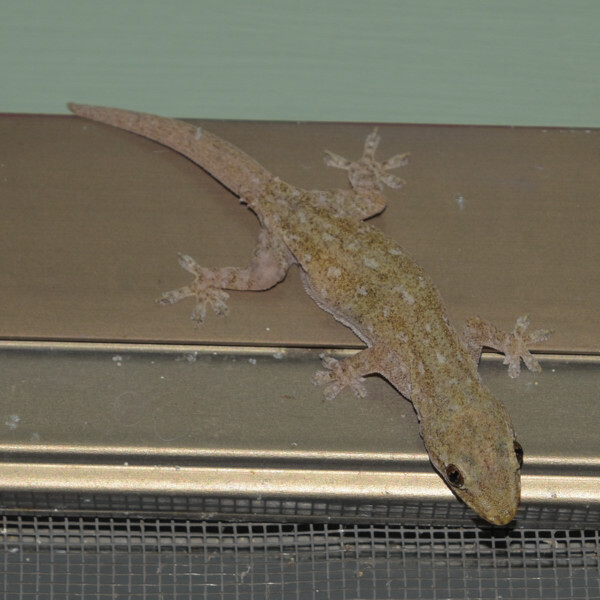 Finally, Galen the gecko is still surviving. Which possum and baby is it that I'm now regularly seeing in box 7? The possums are Sasha and her baby Pogo. Ah, cool. Is it unusual for mothers to keep their babies around so long? We have two baby possums here that seem to have been born around the same time as Pogo - similar level of development, too, by all appearances - but their mammas kicked them out weeks ago. Sasha is a big possum and her last few babies have been particularly large for their age. Although Pogo looks quite big, he's actually fairly young. Pogo has been out of the pouch for only a little over two months now. 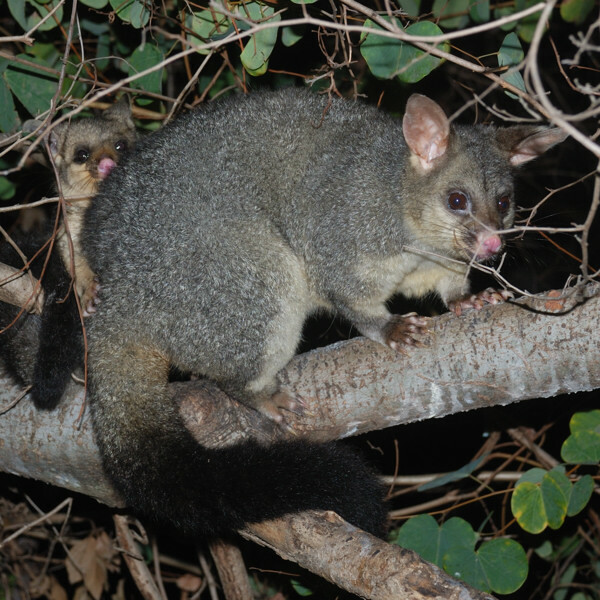 Normally a baby will leave the area at six months out of the pouch, with seven months not being uncommon. Of course he will stop sharing a nestbox with Sasha considerably before the six months is up, but I expect they'll still be together for a while yet. That said, it's quite possible that Sasha is more indulgent towards her babies than other possums. 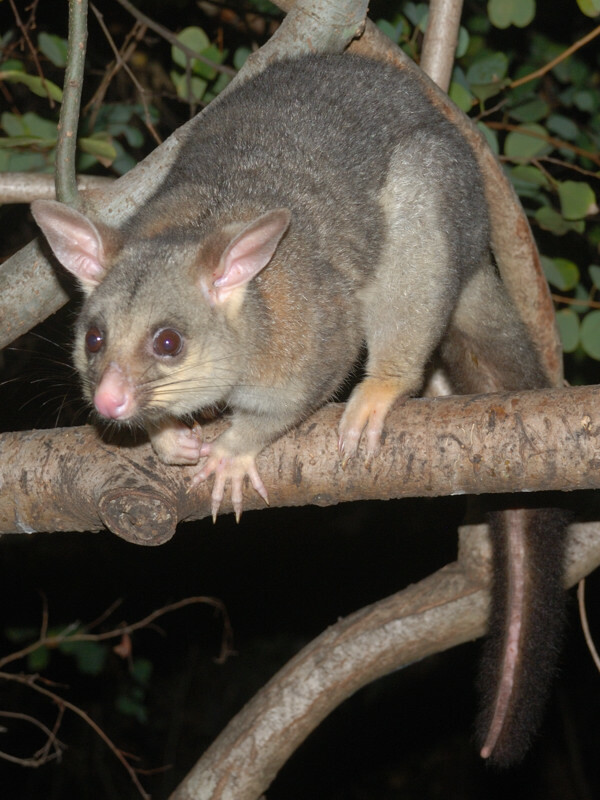 In recent years, the local area has been more and more heavily developed and more and more possum habitat is lost. 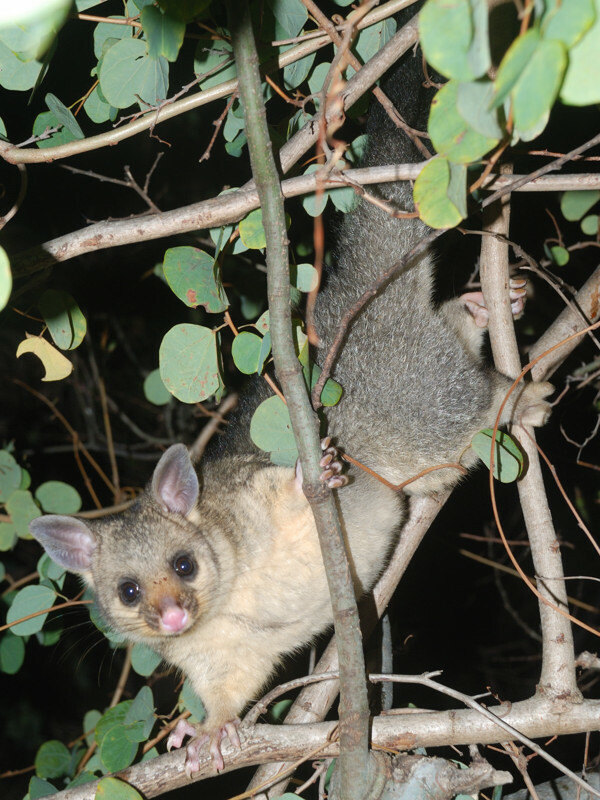 It has been said that possums give birth to more male babies during times of population stress, and all of Sasha's seven (known) babies have been boys, so it's likely there is severe competition for young possums leaving home. So it could be that Sasha is doing everything she can to get her babies as big and strong as possible before they have to leave. Hi, was Pogo gone? Recently only mother is sleeping in the possum box. Pogo is no longer sharing a sleeping spot with Sasha, but is sleeping relatively nearby in the garage and hasn't left the area. He visits the house pretty much every night. By the way, my apologies to anyone who has been having difficulties watching the possum webcams recently. The Telstra cable Internet has been going off line for up to 13 hours at a time since the 24th. It's working at the moment, but it's far from certain that the problems are over. Glad to hear Pogo is still visiting. 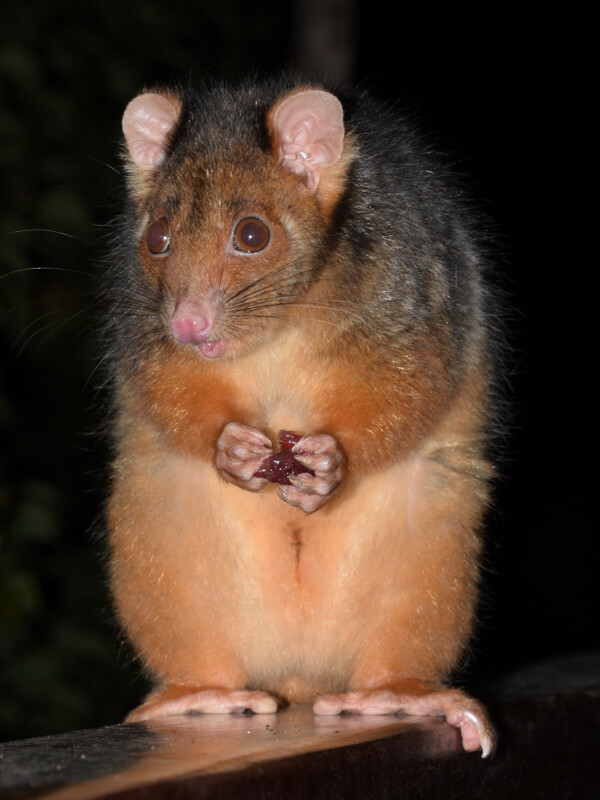 I have some possums in my area and have been feeding them many years, but once the baby grows up enough, the mother kicks him/her out and I've never seen son/daughter possums again. Yes I couldn't seen the possum webcam page for a while. But it seemed fixed today.